This weekend was a first for our family. Matt and I went away overnight on a date (no, that isn’t the first, but I will admit, it doesn’t happen often!). The “first” I am referring to is Kaydee and Emmet going to a cattle show all by themselves. Oh – they weren’t totally on their own. We had a very nice neighbor that was kind enough to let our heifers hitch a ride to the show in their trailer. And, another family who lives just down the road was there, too. Not to mention all of the wonderful families we get to visit with only at shows…yes, it takes a community to raise a child and the cattle show community was there for us this weekend. Oh – it took a tremendous amount of TRUST on our part to let our kids go 3 hours away on their own, stay in a hotel on their own, get up in the morning and take care of the heifers on their own; get the heifers show ready and be in the ring on time on their own; and on and on and on. But, they did it! They joined some wonderful friends for a Thanksgiving feast on Thursday night after they got the cattle washed, fed and settled. They got all checked in for the show and into the hotel. The didn’t wreck! Wow! Maybe we have done a few things right getting them to this stage, LOL! I just can’t believe they did all of that, and did well, without me there doing my motherly duty of nagging! The kids had a great “Showcation” over Thanksgiving weekend, while Matt and I spent a day celebrating the life of a very good friend who got to spend his Thanksgiving in heaven and then we left for a couple of days in the city – First for us…attending an NFL game. FUN TIME!!!! Back to the kids… What is a “Showcation” you might ask? 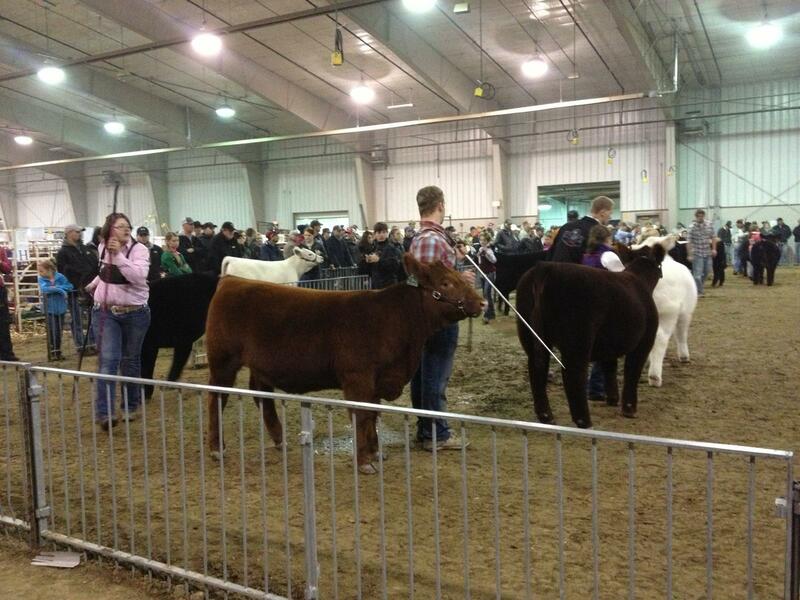 It is time off work that is spent at a cattle show or in a cattle show environment. Showcation often financially replaces a traditional vacation. (for many years). But it is SSSOOO fun!!! Trust…it has to be earned. It can take years to earn one’s trust and then it can be diminished in one quick wrong choice. Yes – I said choice. Every decision we make is a choice. For those of us growing food for many others besides ourselves, we make the choice every day to treat our animals well. Our family chooses to raise cattle that will become beef, which we hope many, many others enjoy as part of healthy meals. Our choice to keep our cattle healthy and comfortable will result in a great eating experience for someone else down the road. We want customers to trust that the beef they are buying is tasty, tender, and healthy and that the cattle were treated well along the way. Life is full of choices and opportunities to earn trust. The kids passed a BIG trust test this weekend. We certainly aren’t ready to let them drive that far on their own with the pickup and trailer! However, we might let them go places on their own more often. And – that means more dates for Matt and I! Plus, I figure that if the kids are hanging out together, they will look out for each other and we don’t have to worry about them being out on dates – at least for now!